Thousands of pesky starlings launch from a power line west of Smithfield recently. Groups of starlings are mesmerizing to watch as thousands fly in murmurations, or flocks, gracefully changing shapes like Lava Lamps through the air. The birds have an uncanny ability to move swiftly and synchronously. Once disturbed, starlings move into an intricate mass as thousands change shapes in an unreal dance. 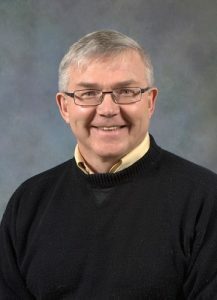 Dr. Terry A. Messmer, a Utah State University professor and Extension Wildlife specialist in wildlife conflict management, understands problems starlings can cause. The birds have attracted the attention of physicists who try to understand how their group behavior can spontaneously arise from many individuals at once. 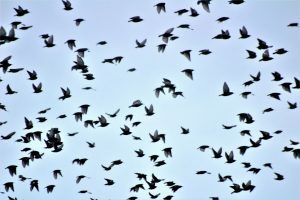 As interesting as they are to watch en masse, the dark speckled birds are one of the more destructive invasive species in the U.S.
Dr. Terry A. Messmer, a Utah State University professor and Extension Wildlife specialist in wildlife conflict management, knows all about the starlings. He said starlings, scavengers, do very well because humans subsidize them. We provide a year-long food base for them. He said 30 pair of starlings were introduced in the 1890s by Eugene Scheffellin, who wanted to expose America to the animals mentioned in Shakespeare’s writings. He wasn’t happy with the result, so he released 40 pair a year later. Starlings, and other introduced birds, produce 70 percent of our bird biomass. The birds were introduced with no natural predators or disease to keep populations down, and their numbers increased dramatically. They nest in building cracks and other tight spaces. Starlings nest in dryer vents of homes. They also find their way into vacant homes, then can’t find their way out and die in the home. Once disturbed, starlings move into an intricate mass as thousands change shapes together. Messmer said beside starlings, blackbirds and their neighbors, the weaver finch or house sparrow, are not native to the United States. They were introduced into the U.S. and have become a problem for native wildlife. The best way to manage them is integrated pest management. The main thing is keeping them out of buildings and other structures. If we can stop them from nesting near or around structures and remove the feed source, we can begin to manage them, Messmer said. He said starlicide can also be used to help control the birds. It can only be used by registered applicators. One pound of bait will kill about 100 to 200 starlings when used properly. Human conflict with wildlife is something we need to understand, said Messmer. Tanya Espinosa, a USDA public affairs specialist, said starlings cause damage to property by nesting in locations such as venting systems and gathering in large groups, leaving large amounts of excrement that people accidentally walk through and breathe. Starlings crowd power lines west of Smithfield.